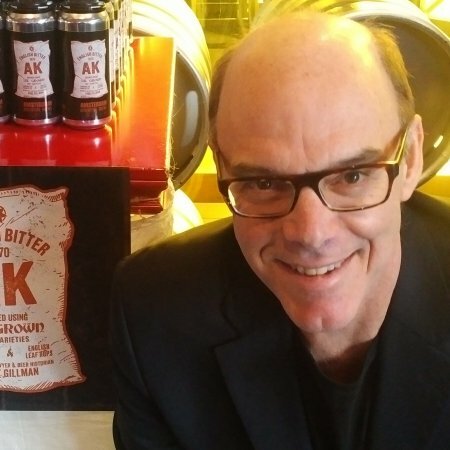 TORONTO, ON – Amsterdam Brewery and beer historian Gary Gillman (pictured) have announced the release of a second annual edition of a beer that recreates a classic of the past. 1870 AK Bitter (4.7% abv, 40 IBU) is a pale ale based on a Victorian beer recipe uncovered by Gillman several years ago. The first edition was brewed in early 2018, with Gillman describing the brew day and giving some further background about the beer on his blog at the time, as well as providing a review of the final product when it was released last April. Instead of Maris Otter floor malt we will use Chevallier, a historical variety [that] is certainly a valid choice for any such project as it existed in 1870 and indeed was widely used. […] For hops, we are using only one variety, English leaf Golding, vs. two last year. They will go in mostly at the outset of the boil, which some Burton practice approved, with some in the whirlpool stage too. Hops were added at different times during the boil in the past, as today. There was no iron rule but adding much of the load at the front end hopefully will impart maximum bitterness particularly as we intend to boil for two hours, as against one last year. The new edition of 1870 AK Bitter will be launched tomorrow (Friday March 22nd) at 4:30 PM the Amsterdam Barrel House (87 Laird Drive, Leaside). A special line-up of English style ales will be available by the glass and flight all weekend – including regular and nitro versions of 1870, Tradition Oatmeal Stout (4.4% abv, 28 IBU) on nitro, Rocks and Shoals English IPA (5.8% abv, 42 IBU), and English Dark Mild (3.7% abv, 20 IBU) – and an English dinner feature will also be available on the food menu. 1870 AK Bitter will also on tap at the Amsterdam Brew House (245 Queens Quay West, Toronto), and available in 473 ml cans in the adjacent retail store, but the other beers and food specials will be exclusive to the Barrel House location in Leaside.